Riverfront Park and Ascend Amphitheater. Photo: Metro Photographic Services. 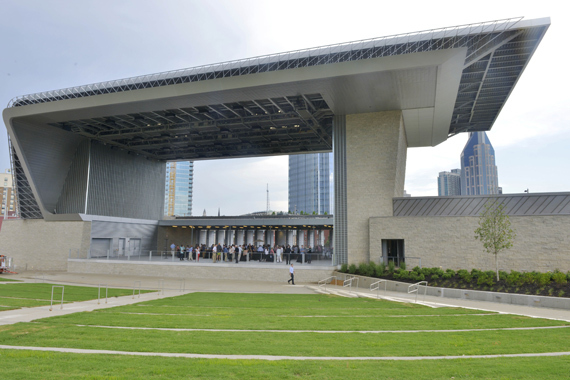 Over two years since it was announced, Riverfront Park’s Ascend Amphitheater will celebrate its grand opening ribbon cutting July 30. Eric Church will then christen the venue during the Live Nation Concert Series presented by Journey’s (the Nashville-headquartered teen retail chain) with two sold-out acoustic evenings July 30-31. A free, four-day community open house will be held Aug. 2 from 1:00-5:00 p.m complete with tours of the amphitheater and performances by local bands and DJs. The park includes a 1.5 acre lawn known as “The Green,” as well as previously announced multi-use greenway trails, which serve as a connection to city greenways and parks north, south, east and west. Also featured are ornamental gardens (with 267 trees representing over 38 species helping achieve Level 1 arboretum status), Nashville’s first downtown dog park, WiFi access, exercise and sports facilities, including two basketball half-courts and over-scaled customized swings. The 11 acre parcel is currently on track to receive LEED Gold Certification for its green roof (with solar panels and media charger), 400,000‐gallon rain harvesting tank, geothermal heating, cooling and ice machine system, 48 bike parking spaces and bike repair station. Aimed at becoming the “front porch” of Nashville, the project’s design is intended to reflect the Cumberland River it sits beside. Sinuous curves throughout the park and multi‐coursed limestone walls and building face are intended to feel as if they are being carved out of the earth. Site walls (rebar fence and railing) and the amphitheater steel skeleton and open roof structures reflect those of abandoned gantry cranes from the barge industry and steel structured bridges. 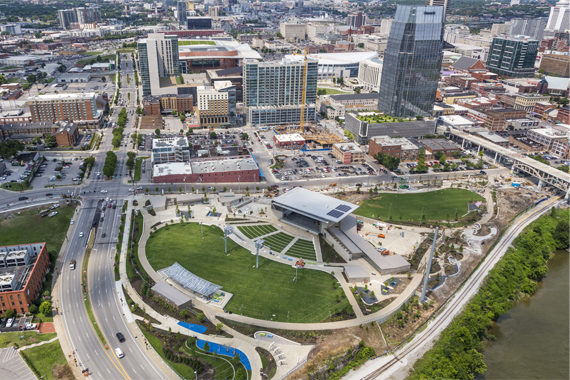 “Ascend Amphitheater and Riverfront Park transform a prime piece of downtown real estate with great music and beautiful green space for all of our residents and visitors to enjoy,” said Mayor Karl Dean. 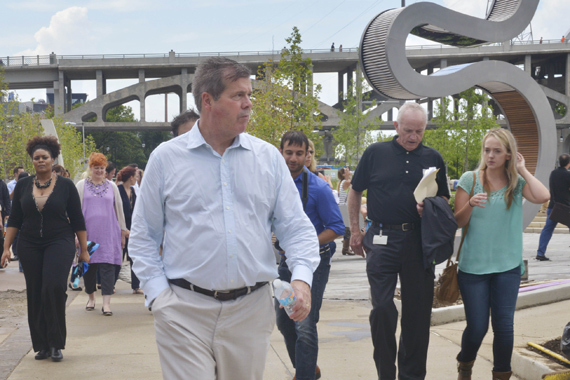 Nashville Mayor Karl Dean leads a Riverfront Park Project Team tour. Photo: Metro Photographic Services. Ticketed events will close the park, where the state‐of‐the‐art electronic shell accommodates acoustic performances through small microphones over the orchestra to feed advanced digital signal processing and loudspeakers to create the same reflections an orchestra would hear from a physical hall. It is one of only a handful of outdoor electronic shells in the world. The amphitheater provides seating for approximately 6,800 (2,200 removable chairs, lawn capacity of 4,500 and approximately 100 premium box seats between the reserved seating and lawn). A 45‐foot grade overlook offers sightlines of no more than 300 feet to the 55‐foot x 100‐foot stage. The artist wing of the amphitheater supports five dressing rooms of varying sizes with private baths. In addition, “The Alley” is an artist lounge area where a private outdoor deck is provided. “The Mockingbird Cafe” has a full kitchen and provides dining for the stage crew or a small event. The 2500‐square‐foot “Riverfront Room” sits below the stage facing the park green with an adjacent outdoor, natural stone terrace to accommodate meet‐and‐greet events with artists or private community events.